Is chase OK? The short answer is yes. It’s a great way for dogs and pups to burn energy and practice “prey/predator” skills in a playful way. But chase can become dangerous if it goes on too long. When any dog runs with this kind of speed, he or she builds up adrenaline, which means the dog is not thinking clearly and calmly. Chase that escalates in intensity, especially if it results in body slams or biting when the other dog is reached, should be stopped. One way is to grab one of the dogs and put them between your legs for a little break. Rub their nose and head to calm them down. After a few minutes, they should be calm enough to resume playing at a level of lower intensity. 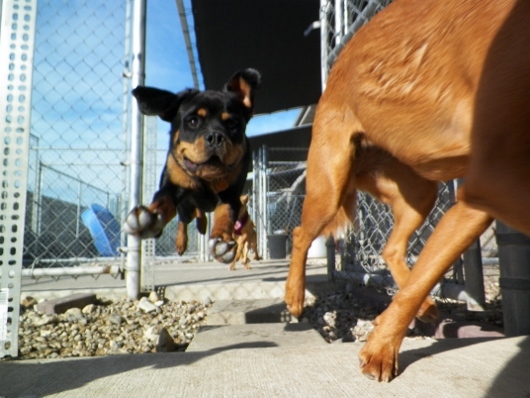 Giving your dog breaks in play is a great way to teach obedience and impulse control. 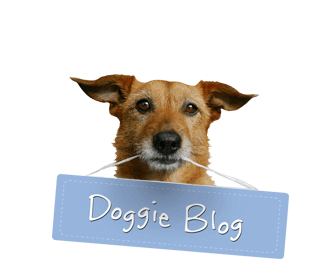 Could every dog tolerate being jumped on by another dog? Uh-uh, no way! The kind of play Sage and Choobik are engaging in is body play. 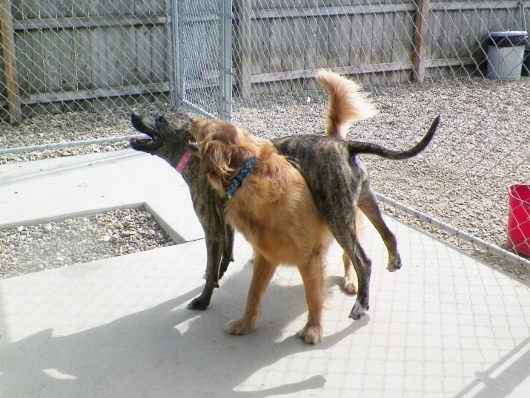 Unlike chase, with this kind of play, the dogs stay in a smaller space and “box” and wrestle, usually with both dogs remaining on their feet. It’s kind of like mixed martial arts…both are trying to prove their superiority. Both of the dogs featured in this photo have silly, playful temperaments. They are perfect playmates for each other. Neither is likely to get “ticked off” at what the other is doing. When Sage jumps on top of Choobik, he is OK with it. Of course, he bucks her off quickly, but it’s all part of the game. Dog expert Sue Sternberg calls this kind of play “squirting,” where dogs share physical space and kind of flop around. It’s very fun to watch but should always be supervised. 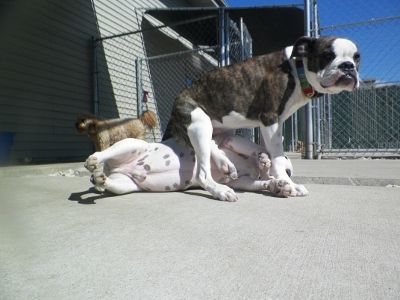 You can help by praising each dog when they are playing well, and scolding them when they are getting too rough. These two dogs are siblings, and they couldn’t be cuter together. They are taking a break after a bout of rolling around on the ground together being silly. 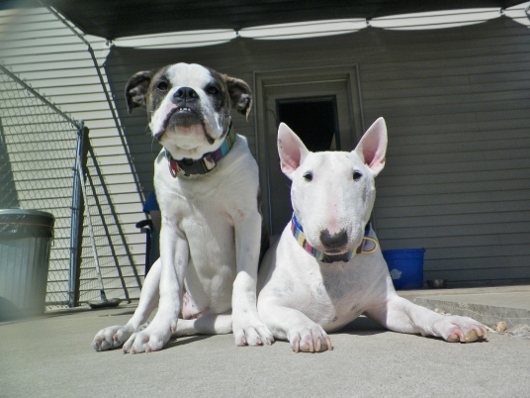 Mac (the bull terrier) is an adult dog (7 years old), and Nala is newer to the family (6 months old). Lots of times when people bring a new puppy into the family, the adult dog initially has a hard time accepting the puppy. Often that’s because the puppy doesn’t know the rules of the household yet, gets extra attention, and bugs the adult dog with playfulness. When you bring a new pup into the household, it’s important for you to be an advocate for the adult dog (let them be first in doing things, and also allow them to “teach” the puppy) as well as for the puppy (don’t let the adult dog be mean to or hurt the puppy). With a little time and supervision, the adult dog and the new pup can become besties, like these two. Two things strike me about this photo: first, how often dogs of the same breed tend to feel at ease around each other, and second, the fact that Clover is laying down shows how comfortable this group is. When dogs are moving around in a group, it’s rare that one of them will lie down. That’s because it puts them in an inferior position, which most dogs perceive as dangerous. In this case, Clover doesn’t seem to mind having all these tall dogs walking around her; it’s clear that she trusts them. And the other dogs do not feel the need to show their superiority by looming over her. 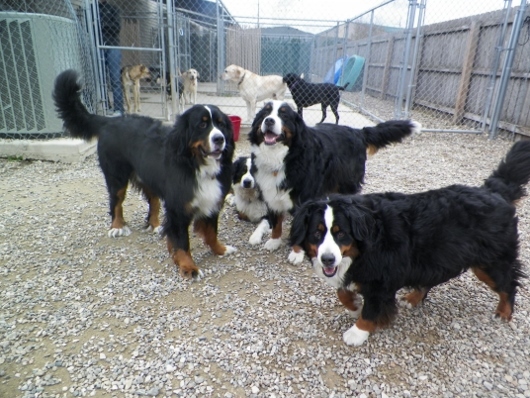 This is a great example of a dog group “just being.” While they are not actively playing, like some of the other photos we have featured, they are enjoying each other’s company and feel relaxed and happy.